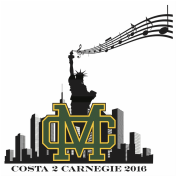 Greetings parents of Carnegie performers! ​Set your mind at ease. We are happy to offer online payments. No more tracking down checks. All transactions recorded seconds after payments are processed. PayPal has offered us a low non-profit rate of 2.2%+ 30 cents per transaction. They are added to the installment amounts indicated. ​*The final installment payments for both students and chaperones will be a variable amount depending on individual fundraising $ earned, overall fundraising efforts and final airfare cost. We will send you an individualized statement at this time. CHECKS ONLY for last payment. Rather write a check? Please make it to MBx Foundation and write "Carnegie Payment" and your student's name on the memo line. Send in the check to school. We are grateful to the chaperones for taking in, not only the responsibility of looking after our musicians, but also for shouldering the entire cost of their own travel. NOTE: Airfare is quoted based on current industry standard and will be confirmed 6 months prior to departure. A price adjustment +/- will be made at that time. Items not included in above rate: Transportation and rental of instruments, checked bag fee, 3 lunches. Every effort will be made to fundraise for the transportation and rental of instruments and checked bag fees. Help us fundraise and to offset costs not already included. Contact Beth Nicosia today!